Test transistors using HFE meter from the Multimeter, it should show the gain of transistors (a value around 300 or similar). Check the correct Collector base and emitter while mounting. CBE of 2N3904 and BC547 are reverse. Follow point 1 and 2 faithfully. My Build: I am planning to make my BITX a multiband Tranceiver, with 10MHz IF and a DDS VFO. I will not be populating the analog VFO and BPFs. 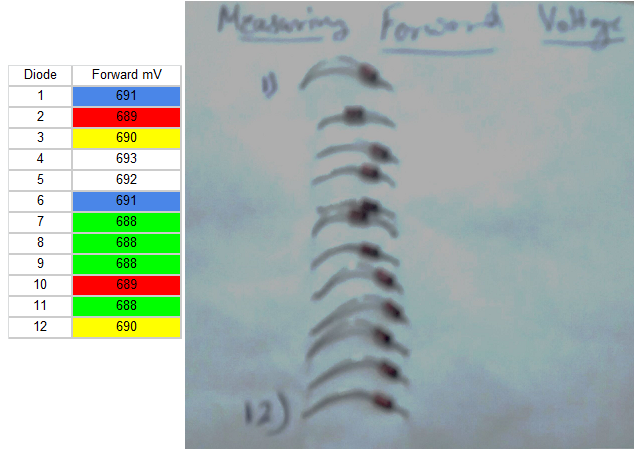 Will build separate BPFs with auto switching on band change from DDS VFO. Thats the plan, lets see how successful I can get. O Ground 2k2 +M Diode -M Put it in a table like this: I used two 689mv Forward voltage diodes in Product detector (D11,D12) and four 688mv Diodes in DBM (D3-6). Keep this matched components safe, till they are used. Audio Amplifier Audio amplifier is fairly easy to build. 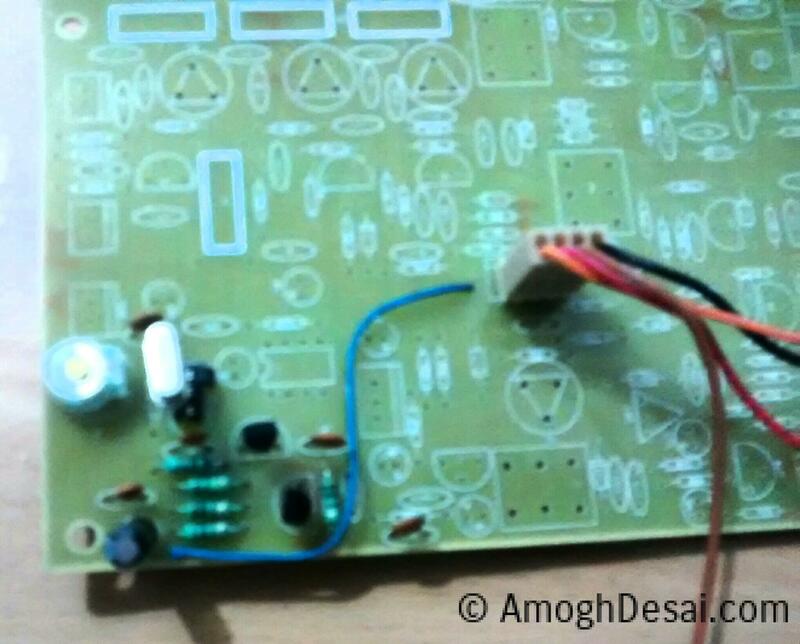 Solder all components as per PCB and circuit. Use 10 Ohms for R64 as per Errata. 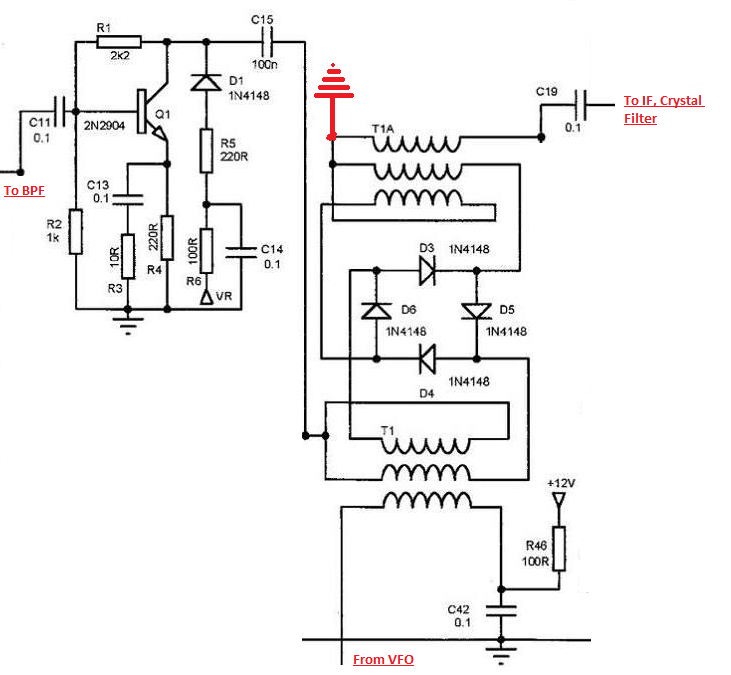 Also mount Q13 as per correct polarity of CBE. Once built, connect the 10k volume pot and Speaker to test the Audio amplifier by passing any music (from mobile,computer, mp3 player, etc) to -ve of C68. Audio Amp is of 2 stages, using LM386 and pre-amp using Q13. So you can test each stage by passing music at either C68 pr C66 to test both stages. (Keep the music volume from source low to avoid over loading.) You should get loud and clear music from speaker. Also another simple test is to touch the top metal lid of C68 or C62 (electrolytic 1uF caps) with wet finger or use tweezer. You should get loud Hum or local broadcast station. I get the local station pretty load and clear with the wet finger test. Trifillar Winding for Product Detector and Double balanced Mixer. Take 3 pieces of 28 or 30 Gauge enamelled copper wire of around 1.5 meter length together. attach one side to a fixed point and other to a hand drill or use a pen/tweezer on the other end to turn the wire. Give good and even amount of turns across the length of wire. Take the tv balun core and wind 13 turns on each of the balun. (Make space in the balun holes using a toothpick if turns won't fit). 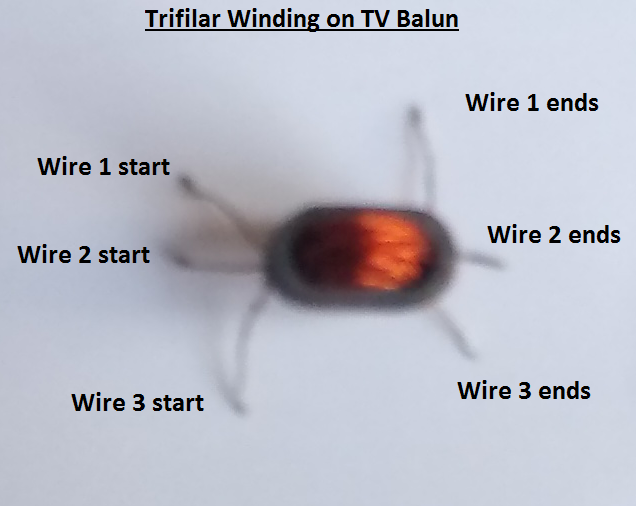 Make 3 such trifilar windings. one for product detector T2 and 2 for Double balanced Modulator T1 and T1A. Check the video on this link for understanding how to make the trifilar wire and how to make the winding. Once 3 trifilar windings are made, test each winding with a continuity tester (low ohms setting) on Multimeter for short or cuts while winding. Also align the 6 wires from both sides of each winding with continuity for mounting on PCB. Please note each wire starting from one side and ending on the other side should match and should be exactly opposite while mounting on PCB. 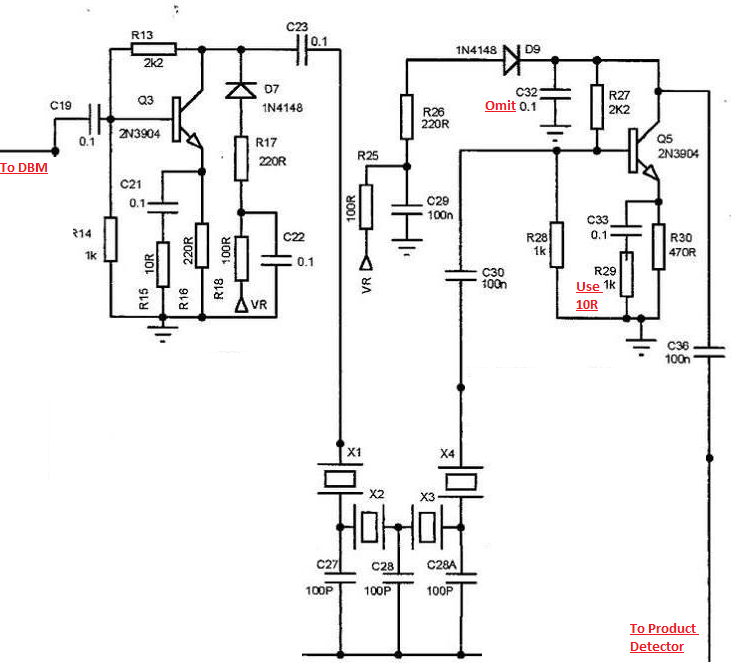 Example: Product Detector Solder all components including T2. 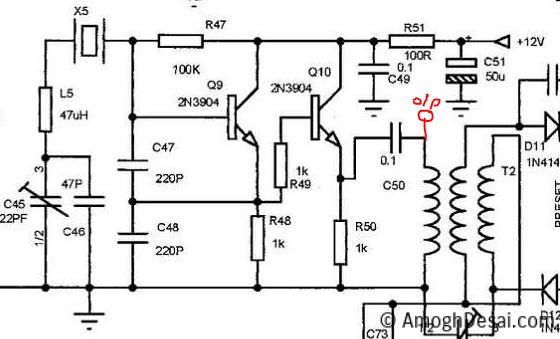 Use diodes D11,12 matched earlier. Short all 3 pins of Preset between D11,12. (You can omit C52 trimmer and C53 for now). As per Errata C73 should be .001uF. 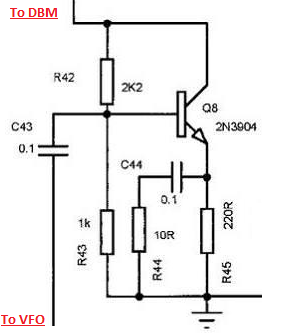 IF Chain and Crystal Filter Mount and solder all components as per the circuit below. Omit C32 and use 10R for R29 as per Errata. Solder 4 matched crystals. Solder transistors as per correct CBE pins. Double Balanced Modulator Solder the T1 and T1A, with 2 trifilar winding made earlier. Test wires from both sides of each winding for continuity while soldering. As per Errata Ground the T1A correctly. Solder 4 matched diodes at D3 to D6. VFO Im not building the On board VFO, and using this DDS VFO. 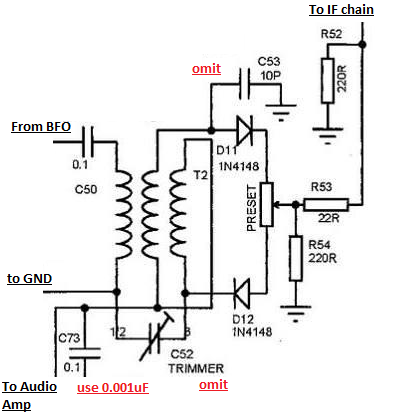 Build the VFO buffer amp using Q8 to use with DDS. As below: Testing The RX Chain. I will be mostly using an RTL SDR dongle for most of my testing. You may well use Oscilloscope and other tools for your test. You can even use a broadcast receiver for some of the testing. We have already tested our BFO and Audio Amp. We will now test the remaining RX chain.You can use your own methods for testing. 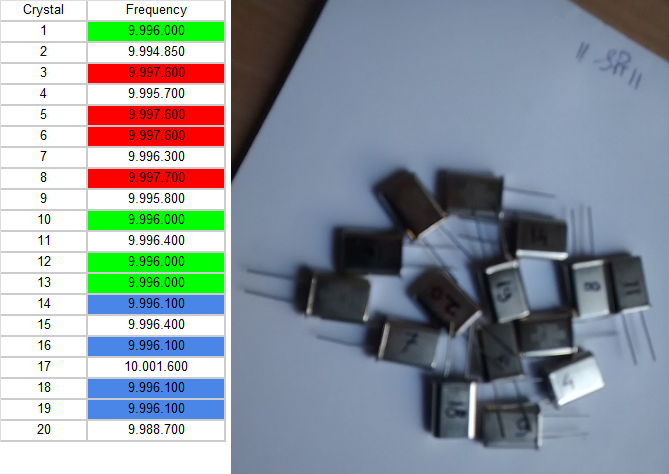 I disconnected the C50, and used a 16Mhz crystal for X5 in BFO (which I had spare from a arduino), you can use any crystal for testing and do the math. Take the output of BFO and feed it to C11 (as antenna input). Do not forget to test if the BFO is oscillating at 16Mhz. Now give a 6 Mhz signal from VFO (I use DDS) at C43. 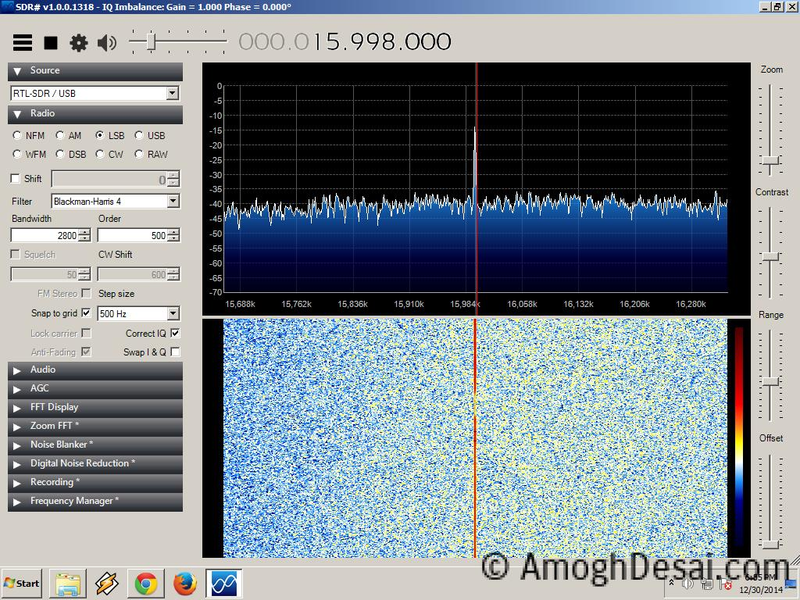 The DBM should mix your Antenna signal (16Mhz) and VFO signal (6Mhz) to give 2 products. To test this connect the RTL Dongle (or oscilloscope or a broadcast RX with digital dial) to DBM output at C19. 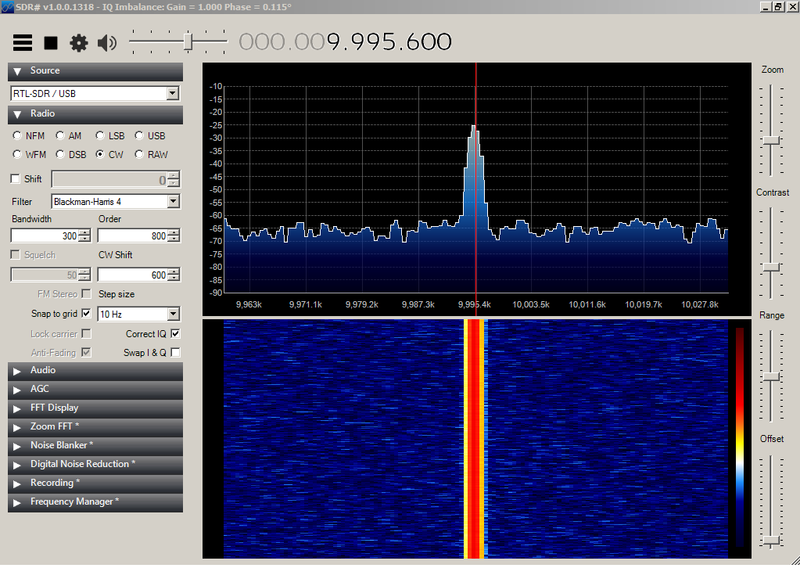 You should see a signal at 10Mhz and 23 Mhz.